WHATEVER credibility the Federal Reserve had before Christmas Eve, it's lost since then, writes Dan Denning, co-author of The Bonner-Denning Letter. Under Jerome Powell, the Fed went from intending to raise rates three to four times in 2019 to saying market rates won't go up again this year. The federal funds rate is stuck at a ceiling of 2.4%. That means there's almost no room to meaningfully cut interest rates before the next recession begins, which could be any day now, if it hasn't begun already (which it has). Powell allowed himself to be browbeaten by Donald Trump into abandoning the normalization of interest rates. That was bad enough. It's telling that, after a 10-year economic expansion with record-low unemployment, the stock market simply couldn't bear a modest reduction in the Fed's balance sheet without threatening to enter a bear market and causing panic in DC. 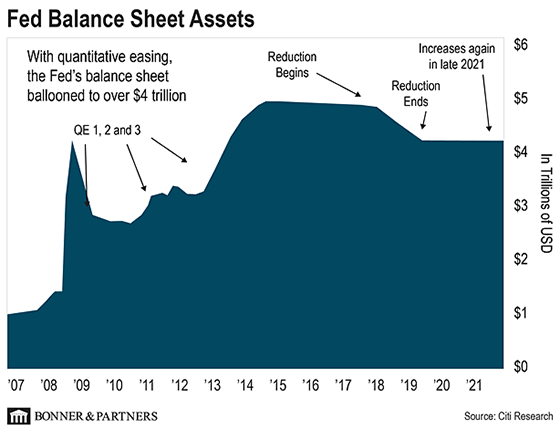 As you can see from the image below, the Fed balance sheet peaked at just over $4.5 trillion in assets in 2015. It consisted mostly of Treasury bonds and notes and mortgage-backed securities. The "runoff," or quantitative tightening (QT), began in October of 2017. The Fed allowed $10 billion a month in securities to mature without reinvesting in new issues. The pace of the "runoff" increased to $20 billion a month in January of 2018, then $30 billion in April of 2018, $40 billion in July, and finally $50 billion in October, when the market finally had enough. Right before the about-face in December, Powell assured the market that the balance sheet reduction was on "auto pilot." Combined with no new purchases and the "runoff," the balance sheet had "shrunk" to under $4 trillion. But the market freaked, and Powell capitulated. Where does that leave us now? The loss of political independence will accelerate if Stephen Moore gets on the Fed Board. Moore is Trump's latest nominee and is a Trump man through and through. And as Bill has been telling you in the Diary, Moore is a true believer when it comes to keeping rates low. But what does that really mean for monetary policy? It means that in 2019, we've come to the end of the road with conventional monetary policy, or using interest rates to try and heat up or cool down the economy. The Fed has conducted an unprecedented experiment, creating phony money to buy assets. It has distorted market prices so much that the stock market is addicted to easy credit policies and literally cannot survive without them. The situation is not dissimilar to a drug addict or a patient on life support. Remove the pumps, medications, and tubes and the patient cannot survive. The Fed's balance sheet isn't going to shrink or "normalize." If anything, it's going to grow. Like a cancer. And it will kill the patient – the American investor.